RECENT EVENTS – THE LUCIFER PROJECT | Watchman - Declare What You See! Here are a few additional things that have come to “light” since The Lucifer Project – Raising Antichrist was completed and posted. President Obama signs the bill to become law to establish the memorial to Ronald Reagan’s 100th Anniversary Celebration in 2011. Next, President Obama has appointed an 11 member panel assigned to the task of preparing a 100th Anniversary Celebration for Ronald Reagan in 2011. There’s the number, 1111, coming up again! Another site that addresses the bill signed into law by President Obama on the Reagan Centennial Celebration and a possible new coin to be offered as well. Here we have the unveiling of former President Reagan’s statue at the Capitol Building in Washington, D. C. via a video produced by CNN. Please make note of the time the video runs – 3:33. Three minutes and thirty-three seconds! There is that number 33 again! It is my conviction that Isaiah is speaking of America as the land of the Chaldeans, and of New York City, a type of Tyre, in the following verses of Isaiah 23. 1911 (Reagan’s date of birth) to 1981 (when Reagan first took office as President) is seventy years. When he took the Oath of Office facing the Obelisk, he turned the nation toward a strange “god”, and then the nation committed fornication with all the kingdoms of the world as seen in verse 17! The Lord will store up the merchandise of the nation for them that dwell before the Lord, which I believe is speaking here of the time during the Millennial Reign of Christ. Finally, notice that this passage starts with verse 13 (rebellion) and ends with the number 18 (6+6+6). Yesterday was the final deadline date that all Television stations were required to convert their signals to digital. Once again, the majority of citizens do not have a clue as to what is going on with this “mandatory conversion” to an all digital signal. The following articles will explain, in detail, what kind of future is before us at the hands of the Illuminati. In short, total control of the population via mind control using the “digital signal” is the ultimate game plan. With your TV, cell phone, GPS, and camera locations, your actions will be “monitored” 24 hours a day, seven days a week! They can tell if you are “complying” to their wishes, or if you are a rebel to the New World Order! Think it can’t happen, it already has via the military use of this Silent Sound technology in Iraq! It is interesting that while Obama’s “official” birth certificate has yet to be disclosed, his rise to political power was in the state of Illinois, which is the same state in which Ronald Reagan was born and raised. It is also a well-known fact that Illinois is the most politically corrupt state in all of America, and its recent governor was forced to resign due to corruption. His attempt at trying to sell Obama’s previous Senate seat has been flashed across every news media service in the U. S., if not the entire world! As previously disclosed, Obama has appointed an 11 member committee to plan a 100th Anniversary Celebration for Reagan in 2011! As I said before, there’s that number, 1111, again! Perhaps Obama’s fondness of Reagan was because Reagan was first a Democrat before “changing” to a Republican. Now there’s, “Change We Can Believe In”, because it happened! Most people still believe that Reagan was a true-blue conservative, but his real background and political actions tell a much different story of his life! While the state of Illinois is connected with both these men, it really gets interesting when you look at a copy of Reagan’s death certificate. Reagan’s hour of death is listed as the 1300th hour! So, what is so important about the hour? First, 1300 hours is military time which is 1:00 P.M. as shown in the following chart. Reagan was the most powerful of all military leaders during his eight years as President, and probably the most powerful military leader in history with his huge defense budget and military build-up during his two terms in office. We have previously seen that the number 13 is associated with REBELLION and WITCHCRAFT, and the 13th world leader to appear in step with the Presidential Zero Year Mystery is most likely to become Lucifer, Satan incarnate in a body of human flesh as an “imitation” of the real Christ. Obama is number twelve in line since the Zero Year Mystery began in 1840. We also looked at the year, 2013, as the potential beginning of the reign of Lucifer, as the year has both numbers associated with the Zero Year Mystery (presidents where 20 years apart) and 13 being associated with rebellion. Then both these numbers add to 33 (20 + 13 =33)! We have also discovered that 33 was Reagan’s favorite number, his lucky number, and can be found numerous times in his life as previously shown. For more on this, refer back to THE THIRTEENTH in Part VII and THE NUMBER THIRTEEN in Part VI. In looking at the hour of Reagan’s death, 1300, I began to further check into any other parallels that might appear “hidden” in this time of 1300 hours. It was the NINTH HOUR when the Lord died on the cross, and the ninth hour is 3:00 P. M. in the afternoon. Israel was the birthplace of Jesus Christ, and he died at the ninth hour, or 3:00 P. M. in the afternoon. Reagan died at 1300 hours, 1:00 P. M. in Los Angeles which, in Reagan’s birthplace of Illinois, was 3:00 P. M. in the afternoon – the exact same hour that the Lord died in His place of birth! Of course, we know that the Lord was resurrected and will come again as God in flesh to rule the world. Is Satan attempting once again to mimic this very event with his son, Lucifer, even having the “hour of death” at the place of birth being the same as the Lord’s? In looking at this from the perspective of Jerusalem time, I saw another parallel of occult numerology. In Jerusalem it was 11:00 P. M., one hour before Midnight, when it was 1:00 P. M. in Los Angeles on 6/5/2004. Here is another 1111, being 11:00 P. M. on the 5th of June (6th month) (6 + 5 = 11) in Jerusalem. Lucifer will attempt to rule from his “throne” in Jerusalem just as the Lord will rule from His Throne in Jerusalem during the Millennial Reign. Since the Bible speaks of, Mystery, Babylon The Great, then ancient Babylon comes into the picture with all the witchcraft that was part of ancient Babylon now being resurrected in Last Day Babylon – the Beast of Revelation Chapter 13 having seven heads and ten horns. So, what if anything does this have to do with the hour of Reagan’s death? In the city of ancient Babylon, it was the MIDNIGHT HOUR! It only takes one second after midnight to be the next day, which would have been 6-6-2004. In occult numerology, that is 6 + 6 + (2004 = 2 + 4 = 6) 666! Here is the number Scripture associates with the Mark of the Beast, the name of Beast, or the number of of his name (Rev 13:17)! When taking into account everything else revealed in this series about Ronald Wilson Reagan, this really does seem more like science fiction that reality. But, nevertheless, the facts are there once again for all who have “eyes to see”! Now we have available a feature length documentary MOVIE of Reagan that was just released this year, and became available for purchase on, 2/9/2009, on DVD! Is this leading up to Reagan’s 100th Anniversary Celebration in 2011 being planned by Obama? Surely, if all this does not receive your attention about the things NOW HAPPENING that are associated with the former 40th President, then should check your pulse! The movie appears to present Reagan, and his policies, as the SOLUTION to the world’s problems TODAY, as well as in his past role as President! Narrated by Newt and Callista Gingrich, which takes Reagan’s life from his birth, in 1911, to his death in 2004. Can you name any other former U. S. President that has had a FULL LENGTH DOCUMENTARY MOVIE OF HIS LIFE made and available for purchase on DVD? Perhaps there are some and I’m just not aware of it. However, with the timing of the 100th Anniversary Celebration, the release of the movie, and the “hour” in which we live, this is really becoming surreal! By now I am reasonably certain that most of the readers feel that they have been exposed to almost everything concerning Reagan and his connections with the Illuminati. But let me assure you, you HAVE NOT! The following information is almost too horrible to picture even when the story is being told to the listener or the reader by the victim. My only goal here is to inform the reader of all that directly impacts them, as well as the connection with everything thus far revealed in this Act of the Ages by Satan himself. Before you proceed further: WARNING – THIS IS GRAPHIC INFORMATION CONTAINING SEXUALLY EXPLICIT QUOTES AND SHOULD ONLY BE READ BY MATURE READERS AND THOSE WHO HAVE A DESIRE TO KNOW AND UNDERSTAND THE DARK SIDE AT THE HIGHEST LEVEL OF GOVERNMENT OPERATIONS IN AMERICA! PLEASE REMEMBER, YOU HAVE BEEN WARNED! If words and details of people’s lives, and the reported history thereof, is offensive to you, please do not read any of this book or watch any of the following videos. On August 3rd, 1977 the 95th U.S. Congress opened hearings into the reported abuses concerning the CIA’s TOP SECRET mind control research program code named MK Ultra. On February 8th 1988, an MK Ultra victim, Cathy O’Brien, was covertly rescued from her mind control enslavement by Intelligence insider Mark Phillips. Their seven year pursuit of Justice was stopped FOR REASONS OF NATIONAL SECURITY. TRANCE Formation of America exposes the truth behind this criminal abuse of the Unconstitutional 1947 National Security Act. First, here is a site that gives the entire story in “book form” free to the reader. While you may have a desire to read the entire story, let me direct your attention to just Chapters nine and ten, for “starters”. Reagan is mentioned in several other places in this “book” by the victim of a “mind control” project of the CIA. After you read these two Chapters, you may or may not wish to know more by reading the rest and watching the seven part YouTube videos of the victim telling her story. The following is a link to the actual website of Cathy O’Brien. Those of you who have read THE LUCIFER PROJECT – RAISING ANTICHRIST have seen the things regarding Obama I posted therein. After looking at all the information once again, I began to take another look in regard to the Sumerian Code and these events. Here are a few of the things that I’ve discovered thus far. (This is the number associated with the New World Order under Antichrist (Lucifer – Satan incarnate in human flesh) This number is representative of 666 + 444 which is the number of the Beast and Lucifer added together! BARACK’S WHITE THUNDER = 1260 (1260 days, 3 1/2 yrs., 42 mos., etc.) Thunder is the name of the horse. (Same numerical value of Ronald Wilson Reagan who was the FIRST to take his oath while facing the Obelisk – a Renegade) Then Obama’s Code Name is Renegade. Both qualify as Renegades! Breaking the number 1212 down into sets, the number become (12) 1 + 2 = 3; (12) 1 + 2 = 3; the result in occult numerology is 33! So, any time you see the number 1212, in occult numerology, it is the same number as 33! Considering the things already disclosed about the number 33, the number associated with “promise” in Scripture, this is really amazing! It certainly seems as if Satan’s “Man of Promise” is standing just “off stage” cueing up for the final act! It is a well-known fact that the name of JESUS = 888 in Greek gematria. So, would Satan attempt to mimic that number in his FALSE JESUS? You decide. LUCIFER = 444 + JESUS (false Jesus) = 444 for a total of 888! With the upcoming 100th Anniversary Celebration of Reagan scheduled in 2011 by Obama, this gets more interesting by the minute! He certainly appears to be acting out the role of a “forerunner” just like John the Baptist did for the coming of Christ! It appears that the next World Leader, the FALSE CHRIST, is making final preparations for his ultimate “staged appearance” on the world scene! While I plan on doing a complete topic on the “Tribe of Dan” in the future, here is a video bought to my attention by “Linda”, one of the members who posts on The Watcher Forum provided by David Flynn, author of Temple At The Center Of Time. This video speaks of a physical trait that is said to come down from the Vikings whose origin is stated to be the Tribe of Dan. For now, just watch the video for information about the “clawed hand”, and continue to watch this blog for additional information to come on the Tribe of Dan. Here’s a link that describes the surgery Reagan had on the “clawed hand” and as well as the outcome. The country of Iran is in the news almost daily today, as it was when Ronald Reagan was elected President in 1980, another “connection” between Obama and Reagan. As we have seen, the number, 444, is the number of Lucifer in the Sumerian Code, and comes into play even in the building alignment of the U. N. in New York City as well as the numbers 1776 and 1110. For a full review of this number, refer back to The Lucifer Project – Raising Antichrist. What does the number 444 have to do with Iran and Reagan? If you have read THE LUCIFER PROJECT – RAISING ANTICHRIST, then you will be aware of what has been revealed about the number 1110 as being representative of the New World Order. Ronald Reagan is widely credited with having the Berlin Wall torn down due to the speech he gave at the Brandenburg Gate, and as a result, creating a New World Order! 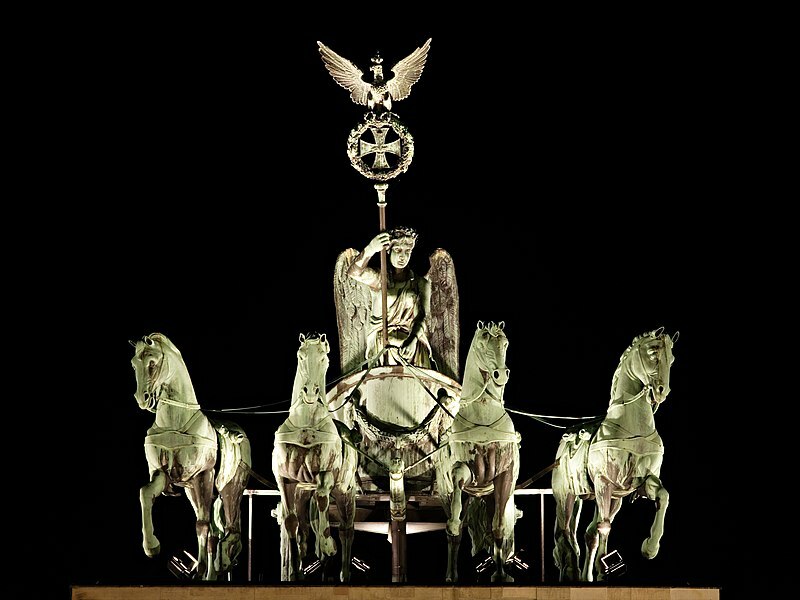 What is less known, is what this “gate” represents with Goddess Victoria driving the four white horses above the Gate known as a quadriga. In summary, we have the “chariot of the gods” driven by either Victoria, or Apollo, depending on the source and history of the story, and Reagan making his famous “tear down this wall” speech at the Brandenburg Gate, and thereby receiving credit for bringing in a New World Order! What are the chances that the Sumerian Code might reveal something about this event? Last week, my wife and I went to Arlington, Texas, to keep two of my grandchildren while my daughter, son-in-law and oldest granddaughter went to Mexico on a “mission trip” to minister to children; and to construct playground facilities for them as part of a ministry of their church. The first thing I noticed after I got to the Arlington area, was that I was driving on Ronald Reagan’s Highway! Immediately, I begin to wonder if these highways, roads, boulevards, corridors and buildings, which have been named in honor of Reagan, might have any “spiritual significance” that would be revealed by the numerical values of the names assigned them. Here are only a few of the things that I uncovered using the Sumerian Code. We know from Scripture that the Antichrist will have a 1260 day reign, it this being revealed here? We have also seen the numerical meaning of 1776 decoded in THE LUCIFER PROJECT – RAISING ANTICHRIST, and the fact that the number of the New World Order (1110) and the number of the Beast (666) compose this number. Here are just two things that also have that numerical value associated with Reagan. Then we have the Reagan Centennial Celebration in the planning stages by Obama and his assigned special preparation team for the year, 2011. RONALD REAGAN’S CENTENNIAL CELEBRATION = 1980 (The year Reagan was first elected President – if Reagan had not been elected President, there would not be a celebration being planned) 1980 + 33 = 2013 which is a possible date for Antichrist to begin his 1260 reign! There are two numbers that have tremendous significance here, 33 and 18. Thirty-three was Reagan’s favorite number, among other things, and 18 is 6 + 6 + 6 or 666 in the occult and the Mark of the Beast or the number of his name; and even when stated differently, the values are still the same! Finally, I also discovered that Reagan’s address at birth was 111 S. Main St., Tampico, Illinois. 1110 is the number associated with the New World Order; and is also representative of the unholy trinity! That number 11 and other symbolisms just keep appearing far too many times for coincidence. Another shock I got was when I highlighted the last small photo of Reagan at the end of Lucifer Project, in my Word program, to copy and paste it – in other words, it became like a ‘negative’ image. The face is totally transformed into an image that I can only describe as predatory and evil. Try it. Like ‘Freudian slips’ and ‘reverse speech’ etc., the ‘truer’ picture of what is being carefully concealed behind a warm and open persona often emerges unexpectedly! I don’t have Microsoft Word, but I did try to copy and paste the photo into my Open Office.org word processor and it worked fine. Don’t know what’s happening with your attempt to paste into Word, but it’s a very interesting outcome. As you are probably aware, Microsoft has established a World Seed Bank in anticipation of something earth shaking coming up in the future, maybe their software is revealing something here! Are you connected with Watchmen 33, out of Jacksonville, AL? No, I’m not the same guy who wrote the book “The Extinction of Evolution”, just another Watchman33 on the wall. Great column – reference to the 11 member panel – sounds like a coven to me. Somewhere in this – since Mrs. Regan believed in the occult – raising Mr. Regan from the dead, therefore a visitation. Your link ( http://wwwwatchmen33.com ) is not working. Phyllis, that’s not my link, but one provided by another reader here. Can I be notified when you add something to your site? It has really been helpful, and fills in so many blanks. Do you have other sites you contribute to? May I ask the same question several others have asked one way or another, and request your identity? Your information is amazing, but I have trouble passing it on when I cannot tell the recipient who you are. There is no system of notification on this blog. Just check for updates in the “Recent Events” section and the monthly archives for new material. As for my identity, I chose and still choose to remain anonymous, since the objective of this blog is to “Declare What I See”, not “Declare Who I Am”. My wish is for the reader to judge the information available here instead of following a personality or ministry. Just say to others, “He is Watchman33, and prefers his identity remains anonymous”. I understand. It is all about the Lord Jesus, His Word, and the coming prophesied (sp?) events. Everything is documentable, been checking… 🙂 I came out of an occult/Masonic family, and rolled right into a cult “christian” church. Been a long road for me, and the price was very high. So, I am very cautious. I look forward to your posts. You are referred to in several sites I respect also. Thank you for all your hard work, and the faithful vigil. I help raise four grand-daughters, and this has been a hair-raising trip in discovering what I suspected underneath….I am concerned for their future, but the Lord has their eternity. They all believe in Him. Keep on keeping on, Watchman33. Thanks for filling in the blanks for this old lady. Thank you for your understanding! As you stated, it is “all about the Lord Jesus, His Word, and the coming prophesied events”. People, such as yourself, who have come out of an occult/Masonic background, seem to have an easier time understanding the things revealed here than those who haven’t had an occult/Masonic family background, or experienced the occult in some type of secret organization. Just posted new information in the RECENT EVENTS – THE LUCIFER PROJECT section regarding our mandated change to digital TV, and the plan of the Illuminati to use it to totally CONTROL and ENSLAVE us! The end of the NY video was creepy. Sandy Duncan flying across the room as Peter Pan singing “there is something in the air”. A woman disguised as a boy who leads children into mischeif and who flys back and forth from this world to another dimension. It sounds like baalzebub-the god of those who fly. We all know who the prince and the ‘power of the air’, is right?? Does this surprise you? Thank you Juhls! I never looked at Peter Pan quite that way, though I was aware of the occult. Walt Disney and his empire are evil to the core. As a young kid, I was drawn to Witchcraft etc, through the Disney cartoon “Fantasia” … especially “Sorcerer’s Apprentice”. I kind of forgot Peter Pan. Thanks for the insite. I help raise four grandkids, and am so grateful I can share the real wonders of life in the Lord Jesus with my four. That is the only “supernatural” that has quality and life! Where is the protest about all this money spent on Reagan, when we have Americans who need jobs, our infrastructure is collapsing, and our currency is almost worthless? The populace at large is mourning a fallen “king of pop”, trying to have a “fun” summer, and no one cares what we are doing in Afghanistan/concerning korea/or rendering our founding documents as useless. We are undone, but the enemy is us! It is more than sad. The country I grew up in, believed in, is not what we have. My grandchildren have little future here. Do we care, people??? I just listened to the Tom Horn and Steve Quayle 2 hour interview. I was getting kind of lost in all the numbers, but when I saw above what you wrote “REAGAN IS LUCIFER = 888”, it took my breath away. They had been speaking about the number for the anti-christ and YAWEH being “888” on the back of the “Great Seal”. YIkes! I will go back and listen again. You can find the two hours replayed on both of their sites. Also, you might want to put all this info under “July” instead of “June” so people will look for new updates. I had already heard the Tom Horn interview by Steve Quayle, which was excellent! In the near future, I plan on posting even more information about the things they discussed during those two hours in regard to Apollo and the Bottomless Pit! Also, thanks for the “tip” regarding placing any new information for July in a different section, as that should make it easier for the reader to find. I keep re-reading, trying to glue all the information into my tired old gray matter. It blows my mind how seemingly insignificant things (like the home address at the birth of Reagan) could have been so planned. Reagan’s parents would not have picked out that address, or known who their son would be, without the information coming to them from a knowing source…one who knows his whole plan, and lays it out to motivate and enslave his followers. Details between major events are not random, but carefully laid out. It is bone-chilling. While this is not a time I particularly want to be living in, I am here and the time is short. I weep over my grandkids, and my whole disfunctional occult/masonic family….so blind. Fortunately, praise the Lord totally, the grandchildren know the Lord Jesus. As does my daughter….the extended family is sooooo blind and deceived. Christians…to prayer! Our time is short to intercede for our loved ones. May I make a suggestion/request? Instead of putting news updates under the month of June, where most won’t think to look for it, put it under a separate “Recent Events” catagory, with no month designated. It really is confusing this way, I believe. Thank you so much for your site. I check it several times a week, and re-read much of it for memory retention. You suggestion is well-taken, and has been implemented. All future posts will go under a new topic heading in the correct archive for the month posted.